Group workshops can be a wonderful addition to your studio to help your students learn together, play theory games, improvise and socialise. Find out how to bring them into your studio in this episode. Hey beautiful teachers last week on the show in Episode 38. We talked about one of the activities that I love to do for my group workshops which is a 12 bar blues ensemble improvisation. But this week we’re going to look at is the business side of it and how you actually structure group workshops and where to fit them into your calendar and what to do to convince parents to attend them or anything else. Any other questions that you might have about how they work. So just to clarify first of all what is a group workshop. You didn’t listen last week. So a group workshop is where students are coming for a one off or semi frequent class with other students. It’s not their regular piano class. It’s more of a general music class where we do bits of piano so it’s not their normal lesson where they’re learning repertoire and scales and all that stuff. It’s an extra of some sort or other and we’re gonna talk about the different options for adding these in. 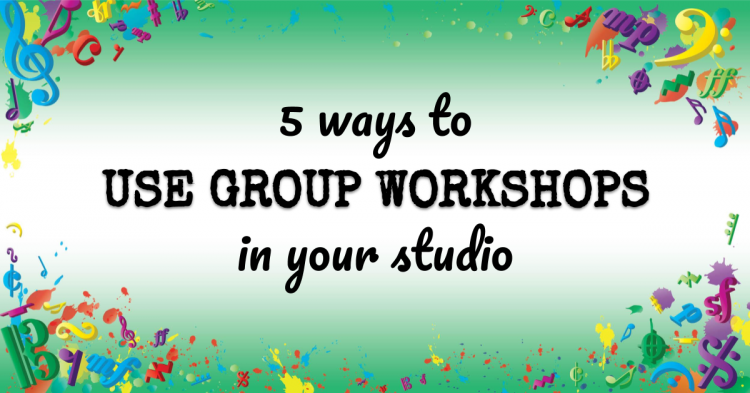 You could also consider almost all of the advice on giving about group workshops. In this episode for when you’re looking at how pretty much all of the same rules apply and definitely the next week’s episode where I’m gonna be talking about planning for group workshops that’s the same thing for camps. It’s just longer because it’s the same kind of one off often with a theme and working on various things that we don’t normally get time to do in our regular lessons. So group workshops can be done very occasionally. They can be done say once a term or once a semester or they can be done more frequently like once a week or once a month. They can be done in place of lessons or as well as them though in my studio we do four group workshops a year. Those are done in addition to my students lessons that week. They still have their regular standard lesson or whatever that is on their regular day at their regular time and then on the Sunday. They have a group workshop. If I was doing them once a month I would not do it like this because it means giving up your Sunday or your Saturday or whenever you choose to put it because if you have a full teaching week then there’s nowhere else you can put it is there. Unless you’re going to put it after teaching one day or something but most likely you maximize that time the weekday time already. If you have a weekday free that you could occasionally donate to a group workshop you could do it that way. But for most teachers who have filled their week already they’re going to have to put it on the weekend so if it’s going to be very occasional like mine and you don’t mind occasionally working on a Sunday or a Saturday that’s fine that’s fine with me doesn’t bother me at all. I think the benefits are totally worth it. But if you’re going to do them more frequently I would consider why do you leave a spot open that is on a Friday evening when you finish teaching and that you know once a month you do the extra workshop then or that you do them in place of lessons which is the other option that a lot of teachers go for as a way to make holidays work or to provide themselves with some time off or some more flexible time. So some teachers will do say one week out of the month they’ll do a group workshop in place of the lessons for that week. I know for some they actually just leave it on the same day. So say you know Susan comes on Mondays at three thirty she’s still going to come on Mondays that we do her group workshop but everyone comes at 4:00 p.m. that week that one week they all come from four to five thirty or whatever it is. So you’re teaching a little bit less but it will take more planning so it’s less teaching time but it generally takes more planning time. So that’s one way to organize it on a week where you’re doing it in place of lessons. But the more popular option would probably be to put them all on one day or a couple of days and then have several days of the week off or with more flexible time shall we say. If you’re going to be planning it’s going to facilitate things like I know some teachers in the US do this for the week of Thanksgiving where they can rework it or Labor Day or various other holidays like that where they know the students won’t want to attend on the actual day but they’ll still be free for part of the week. So putting group lessons on a different day group workshop on a different day can solve that problem and still get them a lesson that week without having to take the whole week off or reschedule those lessons that happen to fall on the Thursday. That’s one reason that teachers can do it. They can also do it just because they want flexibility so they want to be able to take a holiday in October and go to Barcelona to get some autumn sun or whatever it is. And that way you could do the group workshops on the weekend and then get off for the rest of the week. So it gives you some flexibility there for parts of your schedule whether you do them in place of lessons or as well as them. The other thing you’re going to want to consider is whether you’re going to have multi level groups or try to level them. It may be tempting to think that you have to level them that it has to be all your grade one to grade two students together or something like that or that you have to do them by age. And certainly that has huge benefits right. There’s no denying that it would be fantastic to have all grade one to grade two students who are all nine years old and be able to really focus in on their concepts that are relevant to them and work on pieces that they even have overlapping but for a lot of studios that’s just not logistically possible or a little bit I’d stick to think that you’re going to be able to schedule that I’m going to be able to make everyone happy doing that. So what I do and what a lot of teachers do is just to let them be multi-level you can still work in activities and like the activity I detail for you last week the twelve hour blues improv that works for students at any level because some of them might be playing chords and messing around with different left patterns and all that stuff and some of them will just be playing one note and focusing on actually holding it down for four beats right. So it can work really well to have multi-level together to have multiple levels together but that’s a consideration you want to make. And I would say maybe if it’s gonna be a more regular part of your tuition that’s when I would think about them being level I give you are gonna have them every week that every student attends for a private lesson and a group lesson each and every week. Those should probably be level two and they you could work them without it being at a specific level but it’s definitely going to be easier on you and more beneficial for your students if they’re at the same level for those group lessons. So what do you do at the workshops. Well as I mentioned last week I shared a full activity for you to try out with the twelve bar blues but I’ll just run through some of the other things that we might do at group workshops. We would do improvisation like the twelve bar blues or another type of improvisation. We might do games we’ll definitely do games plays and music theory games together. And since I have multiple levels of students I would either split them into a couple of groups or use multi-level games like from VMT there’s pit stop or don’t leave me. There’s loads of them cymbals splash those ones worked great to have all the group together or I might split them in half an hour usually do one game split in half or they’re in two groups. That makes sense and one game where we’re all together at least. And then maybe multiple other ones in different configurations. We also work on practice strategies and coming up with clever ways to practice and sort of directing each other’s practice. That’s something we’ve done as a theme before we do rhythm activities of course. Like I found in my book rhythm in five concert practice or full concert run throws or going over concept pieces practicing them in front of each other and going over concert etiquette and bowing and all that jazz singing games and lines listening and discussing pieces and lots of other things along those lines those are the basics. And next week I’m gonna be going through talking you through my planning process for group workshops or go into more detail about those different aspects and how they fit together in the next show in episode number 40. Let’s talk about money so group workshops. There’s really two ways to handle the money. Either they are rolled into tuition or there is an extra fee for them. Let’s take each one of those in turn if they’re rolled into tuition. That means that they’re almost a bonus. They’re part of being enrolled in your studio and your fee is all inclusive and that includes the group workshops. The benefit of doing it that way is that it’s simple. Number one I mean it’s not simple for you maybe to initially work out your costs and your effective hourly rate but it’s simple for parents to understand. They just pay this thing. They pay their fees every month or every term and that includes all of this stuff. It’s all there. It’s seen as a bonus in a lot of parents eyes which is great is another benefit being part of your studio and you will probably get higher attendance numbers if it’s rolled in. At least that’s been my experience. If you have an extra B it means you can make more probably because you can’t roll in quite the same amount that you could charge for a group workshop if you know what I mean. Depending on whether they’re replacing lessons or not at all of that stuff you probably can’t charge the higher fee for the one day workshop rolled into tuition as you can if it’s just a one off payment but you need to market it. You need to really market it. It’s like selling a whole other thing you’ve already sold them on attending lessons in your studio. But now each time there’s a group workshop you need to sell them on that too and therefore you need to do that in order to get your attendance numbers up which is why I mentioned the attendance right. You’re going to have to market it you get enough people enrolled. So in the end you might not make that much more. It depends on how hard you push it and how much your parents go for it when you do. And certainly you can do a lot of things to market this really well and have it be a huge success but it’s just another thing for you to focus on. So I would just keep that in mind if you’re going to charge a fee for these group workshops. That’s great and that’s a good option. But you’re going to have to market it to plan for that. Know that this means extra planning time for you in terms of marketing and business as well as the lesson prep that you’re going to have to do whether you roll it into duration or whether you charge that extra fee. The benefits are enormous for your students. It allows them to socialize with each other and meet other music students and possibly even make friends with other students in your studio. Depending on where you are and how your community work your students may or may not know each other at side of your studio. A lot of students don’t a lot of students in my studio don’t. There’s very little overlap between schools despite them all coming from a certain radius right. So your students have an opportunity if they’re meeting regularly group workshop to actually make piano friends and establish connections and possibly even get together for play dates which would be wonderful. Then you can play together it could be a literal play date right. Which would be awesome. It’s great to have a piano partner built in duet partner and a friend to play with or even just show off pieces to each other teach each other little bits of rope pieces that kind of stuff. It’s also a great opportunity for performance practice as I’ve mentioned. So this is really why I started when not why but how I started group workshops. I originally was as a concert dress rehearsal. That’s the first way I did them and I think that’s a great starting point. If you’re new to them that’s one of the simplest ones to do as a theme for your first group workshop is to just do it. 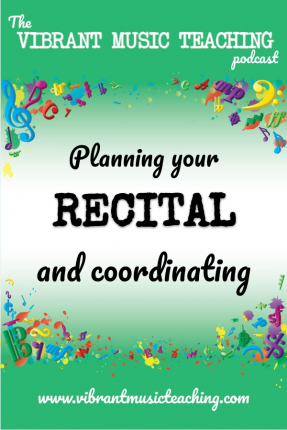 A few weeks before your concert or recital as a dress rehearsal and then you include a few games and some discussion about concert etiquette and handling performance nerves and that kind of stuff and you’re done. That’s it. Nice and easy to prepare the students generally understand the format really easily if it’s a dress rehearsal. And yeah you just have a built in activity with them practicing going up to the piano bowing, performing, checking of their shoes’ ties. That’s just a little way that I tell them I can’t remember who I got this from but to look at your shoes and say are my shoes tight in your head while you’re bowling. It helps them to actually bow for the proper length of time rather than just sort of nodding and wondering. So if you hadn’t met that idea before I think it’s a pretty popular one but if you hadn’t heard of it try that at anyway so practicing performing for each other and performance etiquette and just having the opportunity to get a bit nervous before the big day when they’re really nervous right. Having that first slightly pressurised opportunity but it’s kind of a midway point because it’s just performing for other kids is a great thing to have access to. A big reason for group workshops course in my book is that there’s lots more time for games. A lot of teachers struggle to fit in games into their regular lessons especially if they’re just teaching one on one 30 minutes a week. That’s tough. There’s a lot of things to fit in and you won’t get time to do a game every week. You might have to alternate games and improv and composing into your five minute slot that you have available in your 30 minute lesson. So if you do group workshops adding in group workshops that’s a fantastic opportunity to get students to play games together learn through games improve their music theory and generally just have fun. They also learn from each other in a group workshop setting even more so than when they’re just one on one with you or when they’re two on one with you even having more students present means that there’s more kids to point stuff out to other kids make little realizations and then another kid learns from that. It also shows them that they’re not alone in their journey. This isn’t just them. That’s finding such and such hard I can’t remember that word or struggles with finding whatever. It’s not just them. It is hard. These struggles do happen and they happen to everyone. And realizing that is a big part of how you stay motivated to keep going because it’s the same for everyone. It’s not that it’s just hard for you or your crap at it right. It’s that growth mindset it’s OK I can see how she used to forget that word and she found a way to remember it so maybe I will too. And you drive yourself forward in that way and group workshops. I briefly mentioned this before but if you are rolling them into tuition they’re a great marketing differentiator for parents in your studio. So when I meet with parents I always mention all of this stuff that we do. Your situation includes lessons every week. Access to other games lending library for group workshops a year to recitals a year. It is not just a weekly lesson. And that’s huge for so many reasons one of which is banishing the idea of makeups and you can go back to that episode to check out more about that but makeups aside I won’t get up on my horse and talk about that. It’s a great opportunity to market your studio and make it sound different and unique and not just differentiate yourself on price but on what you’re actually offering. So I hope you’ll consider group workshops for your studio and that maybe this little breakdown of how they could work and how you can charge for them and all that stuff has been helpful. Let me know if you have any questions on the show notes or in the Facebook group. You can find the show notes at the vibrantmusicteaching.com/39 thirty nine and yeah I’d be happy to answer any questions there. And also in the vibrant music studio teachers group on Facebook about group workshops and how they work for you and how they might work for you if you’re adding them in as a new thing. So next week I’m going to be talking to you through the planning process that I use for my group workshops. How a lesson plan for them how I figure out how these things fit together and what to do plan for multiple levels of student and all of that goodness. So that’s next week on episode 40 and I’ll see you there. Bye for now. Just a quick reminder to vibrant teaching members that our office hour calls our Q and A calls are coming up this week. So if you want to hop on over to vibrantmusicteaching.com/calendar you can see what times they are going to be for you and join me to get your questions answered or discuss any teaching issues that you want to discuss. If you’re not a member and you like the sound of having someone to help you along the way and answer your questions about all of these resources and ideas that are available these days then you can hop on over to VMT.ninja. Sign up and you’ll have access to the office hours this week. The above audio transcript of “VMT 39 – 5 ways to use group workshops in your studio_DELIVERABLE.mp3” was transcribed by the best audio transcription service called Sonix. If you have to convert audio to text in 2019, then you should try Sonix. Transcribing audio files is painful. Sonix makes it fast, easy, and affordable. I love using Sonix to transcribe my audio files.